Other photos: Bow Profile Shot to Starboard, Cruisers 500 Express Starboard Profile, Cruisers 500 Express Port Profile, Cruisers 500 Express Freedom Lift, Dockside Port side, Dockside, Anchor Roller, Dockside, Port side walk around, Port side looking aft, Large Port windows that open into MSR, Foredeck with Sunpad, Bow with flush mounted windlass and remote spotlight, Windlass locker with wash down faucet, Bow Sundeck looking aft, View from Bow looking aft, Walk Thru Windshield, Closeup of bow, Tender on Freedom lift - not included, Freedom Lift - tender not included, Hardtop with skylight cover, Huge U-shaped companion seat to port, Enormous U-shaped lounge to starboard aft, Lounge with flip over table top, Double Helm Seat, Ergonomic Helm, Auto Pilot, Chartplotter/Radar/Depth, VHF Radio, Bow Thruster/Remote Spotlight Control, Volvo Gauges/Stereo Control/Ac vent, Dash, Clarion Stereo in Cockpit, Volvo Electronic Engine Controls, Subwoofer, Icemaker/Refrigerator Combo in cockpit, Wet bar with Electric Grill, Salon Entryway, Salon seatign with flip over Cherrywood table, Salon Seating, Galley/Salon, Galley, Galley with Built in Coffee Maker, Power Panel, Flatscreen TV, Galley, Entertainment Center, Double Stainless Steel Sinks with corian covers, Two Burner Stove Top, Bottle and Glass Storage, Galley Shot, Side By Side Refrigerator/Freezer, Microwave Convection Oven, Trash Compactor, VIP Island Queen Berth, VIP Stateroom to port, VIP Stateroom forward, VIP Stateroom to Starboard, Master Stateroom Island Queen Berth, Full Beam Master Stateroom, Master Stateroom to Port-Washer Dryer Cabinet, Entertainment Center in MSR, Master Stateroom port windows open, VIP Head Vanity, VIP Head Shower Stall, Techma Toilet in Master Head, Master Head Vanity, Shower Stall in VIP Head, VIP Head w/Techma Toilet, Engine Room-Generator to rear, Ladder into Engine Room, Volvo D-12's 715 HP, Manufacturer Provided Image. MAJOR PRICE $35,000 PRICE REDUCTION JULY 1........SELLER IS MOTIVATED AND THE BOAT IS IN GREAT SHAPE! 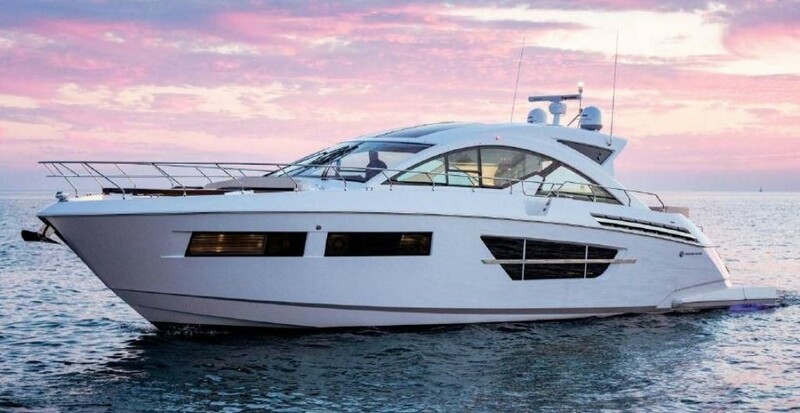 Don't miss this opportunity to pick up one of Cruisers Yachts most popular models of all-time, the 500/520 Express. She is powered with the desirable Volvo D-12s sporting 715 HP each (only 600 hours) that will cruise easily at 28 kts and is loaded with upgrades such as Satellite TV, Washer/Dryer, Freedom Lift, full hardtop with bridge AC, bow thruster and much more. She also sports a new Awlgrip Paint Job on the hull sides so no more fading of colored Gel-Coat! You may find one cheaper but this one has many upgrades.....compare before you buy! Call today and start making your boating plans for the upcoming boating season.